We have about 10 days left in the 2016 legislative session and budget negotiations are ongoing. House Democrats unveiled and passed their budget proposal last week. I have serious concerns about their spending plan, which I'll address below. The Senate Majority Coalition Caucus also passed their budget. Budget leaders in both chambers now have about 10 days to negotiate a final budget agreement so that the 60-day session can adjourn on time. Last year, I introduced legislation (House Bill 1485) to address the shortage of family physicians in our state, especially in rural areas. When this bill was passed by the Legislature and signed into law by Gov. Inslee it was the culmination of a lot of hard work by more people than I can name. I strongly believe in increasing access to quality, affordable health care. Expanding and creating new residency programs for family practitioners will impact Washington residents for decades to come. As a result of my efforts with HB 1485, I received an award from the Pacific Northwest University of Health Sciences. 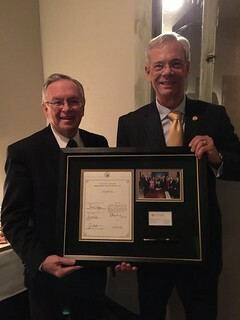 In the photo at right is Dr. Keith Watson, president of the university. As I've continually told people who have contacted my office, this year is a supplemental budget year. That means we make small changes to the two-year operating budget because of caseload adjustments or because of unforeseen emergencies like wildfires. However, Democrat budget writers have taken an entirely different approach. They proposed significant increases in spending on new policies. To pay for these new programs they want to increase taxes by almost $400 million over this current two-year budget cycle and the next two-year budget cycle. These tax increases include ones rejected by voters in the past like taxing bottled water, or proposals rejected by the Joint Legislative Audit and Review Committee which is tasked with finding economic benefit in tax incentives. They also want to raid the state's rainy day fund for non-emergency spending. A couple of thoughts went through my head as I voted no. First of all, the governor signed our current two-year operating budget less than eight months ago! I'd like to think that these significant increases in policy spending could wait until we do the two-year operating budget next year. Second, our state revenue forecast trended down for the first time in two years. We're also seeing other state's exhibit economic activity hinting at another possible recession. We should not be draining our emergency reserve fund for ongoing expenses now – that's like spending your rainy day fund the day before it starts raining! The Senate released a much more fiscally-responsible supplemental budget that still addresses our recent wildfires. We'll see what comes out of the final budget negotiations. To get a sense for where the state spends its money, click here to view a “budget universe” chart. The size of each “planet” directly correlates to how much money is allocated from state and federal sources. It's an interesting graphic. Hanford scientists with LIGO prove Einstein was right! If you're a science geek like me you already know that scientists at Hanford played a role in one of the greatest scientific discoveries of our generation: gravitational waves. Albert Einstein theorized about gravitational waves a hundred years ago, but until recently this key component of his general theory of relativity remained elusive. It took two large instruments with the Laser Interferometer Gravitational-Wave Observatory (LIGO) – one at Hanford and the other in Livingston, Louisiana – and a thousand physicists and their research teams, along with two massive black holes doing a dance 1.3 billion years ago, to bring us this final proof. I am so proud of the men and women from our neck of the woods who added their hard work and expertise to this amazing discovery. The science and technology research being conducted in and around the Tri-Cities is truly world class. I sponsored a resolution in their honor and had it adopted into the official record of the House on Feb. 23. I was recently on Charter Local Edition Northwest where I discussed the LIGO discovery, education and the state budget. To watch that video, click here. To listen to a short radio segment on the LIGO discovery, including my remarks on the House floor, click here. To read a great article in Science Mag on this discovery, click here. As a reminder, please join us for our 8th District town hall meeting on Saturday, March 19 from 10 a.m. to noon at the Arc of Tri-Cities on 1455 Fowler in Richland. I hope you can make it as we discuss the 2016 legislative session and other issues. I want to thank Caleb Olson, the son of William and Jennifer Olson from Richland, for serving as a House page recently. Caleb delivered documents to different members and staff while also attending page school to learn more about state government. If you know someone between the ages of 14 and 16 who might be interested in serving as a legislative page, click here for more information. As always, thank you for reading my e-newsletter. Please feel free to share with family and friends. It is an honor to serve you in Olympia.